As well as USAF displays at RAF Alconbury, Bentwaters, Chicksands, Wethersfield and Woodbridge together with Aviano AB in Italy and Chievres AB in Belgium, Roger Hoefling’s record encompasses the role of commentator and overall director of the Air Fete at RAF Mildenhall from its beginning until 1999 and cancellation due to the Kosovo crisis. A USAF event, the Air Fete started as a one-day display on 4th July 1976 as the official Bicentennial celebration in the UK with a three-hour flying programme before 60,000 spectators. Roger’s brief was not only to commentate but to advise on and develop the event. Thus, it become a two-day show in 1978 with seven hours of daily flying as the largest air display in the world staged by the military and the best-attended in Europe with an audience of over 300,000. Facilities for these visitors, the furthest-travelled known to have come specially from Honolulu, comprised planning with four counties’ police forces; around 550 roadsigns; special event radio coverage, the first at a UK air display; park and ride sites at RAF Lakenheath and Newmarket Racecourse; special ‘bus links with two railway stations; an airstrip for light aircraft complete with ‘bus link; an average of 420 coaches annually, many from the Continent, and an official campsite for visitors at a nearby school. Among the Air Fete’s many distinctions were the European or UK public debuts of the USAF’s F-15 Eagle; F-16 Fighting Falcon; F-117 Nighthawk; U-2; A-10 Thunderbolt II; FB-111; B-1 Lancer; B-2 Spirit and C-17 Globemaster III with the Harrier GR5, Tornado F2 and F3 from the RAF and the French Air Force’s Mirage 2000 and Jaguar. In 1984, the world’s fastest civilian and fastest military aircraft, the Concorde and SR-71, appeared for the first time anywhere in the same flying display, while Air Fete ’97 was the first time the USAF demonstration team, the ‘Thunderbirds’, had left North America to take part in a single event. Final appearances before withdrawal from service included those of the RAF’s Lightning and the USAF’s EC-121 Warning Star. In addition to further Air Fete innovations in such as the airfield layout, souvenir programme, exhibition and squadron souvenir hangars, Roger was responsible for the static aircraft and flying displays with examples of the latter’s series of unprecedented operational ‘set-pieces’, demonstrations and formations being listed below. In contrast to modernity, Air Fete ’87 welcomed the DH88 Comet, ‘Grosvenor House’, returning to the airfield from which it had flown to victory in the MacRobertson Race to Melbourne in 1934, still considered the world’s greatest air race. The aircraft, flying in public for the first time since 1938, had taken fourteen years to restore to airworthiness and it arrived to join other de Havilland designs ranging from the DH2 to BAe146 via its later namesake, the DH106 Comet, as part of one of the themes that were highlights of a number of Air Fetes. With participation by aircraft from twenty-nine countries, greater international representation than at any other USAF air show in the world and including thirteen national display teams, the Air Fete’s success was achieved without commercial sponsorship, corporate hospitality facilities or programme advertising while offering some of the lowest display admission prices in the UK. See MEDIA COVERAGE: ‘Air Extra’ 12.1986; ‘Airshow 97’ 4.97; ‘Air Display International’ 3.88 and 4.92; ‘Aircraft Illustrated’ 5.96, 6.96, 7.97 and 11.97; ‘Airshow 98’ 4.98; ‘Aircraft’ 10.2009; ‘Aeroplane’ 12.2015. The Thunderbirds, the United States Air Force’s Aerial Demonstration Team, first participated in the Air Fete in 1984 when RAF Mildenhall celebrated its fiftieth anniversary. To accommodate the team’s first visit to Europe for 13 years, the event was moved from its usual Spring Bank Holiday weekend to that of 9-10th June, ‘The Thunderbirds’ displaying on only the first day. The programme included the SR-71A, flown for the first time at a European display, and a British Airways’ Concorde, making Air Fete ’84 the first event anywhere to feature the fastest military and civilian aircraft in the world. It was televised on BBC-1. Having replaced their six F-16A Fighting Falcons with the F-16C as here, ‘The Thunderbirds’ returned for Air Fete ’97 which marked the USAF’s fiftieth anniversary. The request that the event again should be postponed from late May was declined. 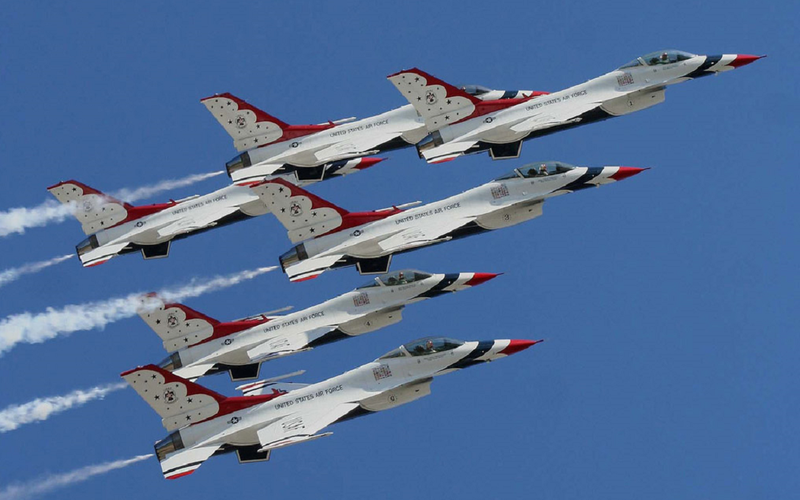 Thus, their display on 24th May marked the first time that ‘The Thunderbirds’ had left America for a single event, the team returning to the USA on Air Fete 97’s second day. The national teams of France, Italy, Jordan, Switzerland and the UK displayed each day. (USAF) See MEDIA COVERAGE: ‘Aircraft Illustrated’ 7.1997 and 11.97; ‘Airshow 98’ 4.98; ‘Aircraft’ 10.2009. Formations: P-47N Thunderbolt and A-10A Thunderbolt II; F4U-7 Corsair and A-7D Corsair II; P-51D Mustang and F-100F Super Sabre; F-15C Eagle, F-16A Fighting Falcon and A-10A Thunderbolt II; Lightning F6, Hawk T1A, Phantom FGR2 and Tornado F2 (4-ship and 16-ship with an aircraft from each RAF fighter squadron); Sea Harrier FRS1 and Sea King AEW2; F-15C Eagle and P-51D Mustang (x2); Sea Harrier FRS1 (x5) simultaneous take-off in five different directions; F-15E Strike Eagle and F-111F (x3); B-2A Spirit and F-15C Eagle (x2).